This month we are excited to have two Awesome Guest Hoppers that you should definitely check out. So, I can't wait to share with you what I created. First the card. I started with a piece of Buttercream Cardtstock and a layer of Green Olive Cardstock. I embossed the Green Olive with the Embossing Folder Say It! I then distressed the edges and the top raised areas with Hazelnut Blend Ink. Then, I stamped each of the leaves from the Autumn Days stamp set with Dark Roast ink on Cranberry Bliss, Summer Days and Oatmeal Cookie Cardstock. I also stamped with Dark Roast ink, the sentiment from the Grateful Heart ATS on ButtercreamCardstock. I then detail cut all these pieces out. Using my Crease tool, I bent the leaves in the middle and curled the edges to bring them to life. I then distressed them with Hazelnut Blend Ink. To finish the card, I wrapped Natural Journey Twine around the card and tied a Wooden Accent button on. 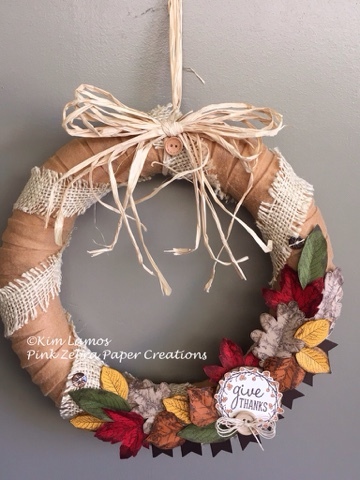 I first took a Styrofoam wreath and wrapped it with tan felt. I then wrapped a piece of light brown burlap around the wreath. 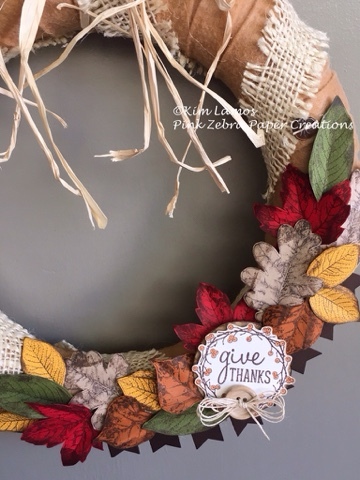 I used the same materials that I used above to create this fall inspired wreath. I then used some raffia to create the bow and the hanger. Here is a little close up on the leaves. And even closer look at the sentiment. 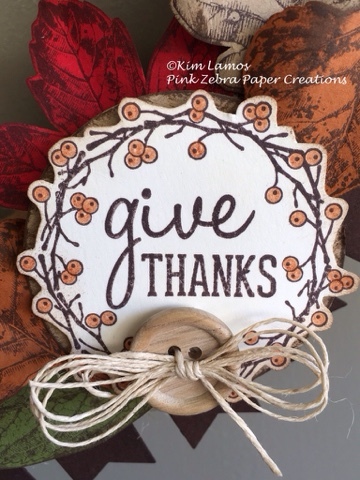 I used the Fun Stampers Journey Color Burst pencils to color in the "berries" on the sentiment. Thank you for stopping by. Don't forget to comment here using the #SFOctHop to be entered into the mystery giveaway. I hope you found some Thanksgiving inspiration. Click on the next button to go and visit Stacey's blog. Beautiful. Love your leaves! Thanks for hopping with us this month. Great projects Kim, thanks for joining our hop! Beautiful! Gorgeous! Wonderful card and wreath.